The elegance of the Amish 54" TV Stand with Plasma Back is sure to shine as you gather with family or friends for some TV or movie time. 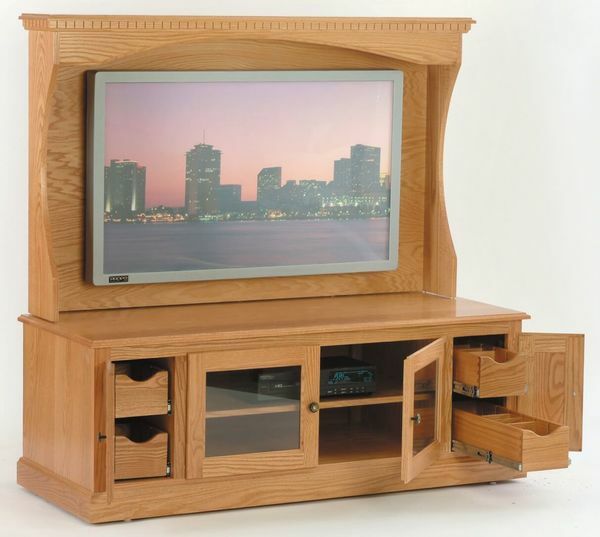 This exceptional Amish made TV stand has a gorgeous curve along the top panel, showcasing your television with solid wood. The stand itself features four lower cabinets that open to a collection of shelving and slide out drawers. There's even more to this TV stand than you see in the photo. The options are endless. You can choose wood, finish, hardware, glass type and more. This TV stand comes in three styles including traditional, shaker and mission. It can be built with just the right look for your living room. We encourage you to email or call to speak with an Amish Furniture Specialist if you have questions. They can assist you in deciding on wood types, finish colors, features and more. Thanks for shopping DutchCrafters.